Do you have a loved one that’s far away? 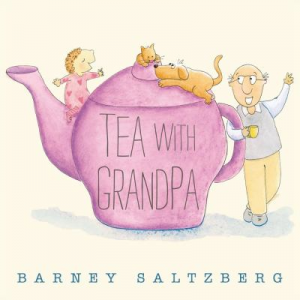 You may enjoy sharing this week’s picture book, Tea With Grandpa, with them next time you have the chance! A little girl and her grandpa share a daily tea time ritual. At the end of the story, we learn that all the fun they have had together has been over video chat on their computer. Even though they are far away from one another, these two manage to sing, dance, and laugh with one another. Tea with Grandpa stands as a wonderful model of child-directed, open-ended play and presents a positive example of how technology can help children maintain critical family relationships.